I’ve been on a quest for quite a few years to make for myself those things I used to have to buy. The reasons for this are really multi-faceted – first I feel pretty empowered that I’ve been able to provide for my family without a trip to the grocery store. Plus making these things myself is always significantly less expensive than the purchased counterpart and that makes my budget happy. It’s also typically healthier without the odd-sounding ingredients you typically see on commercial food labels. And probably most importantly to me – it’s environmentally friendly with less landfill-bound trash. 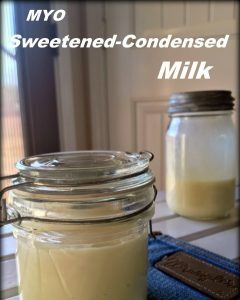 Now I don’t use sweetened condensed milk often but recently I made a favorite holiday dessert and it calls for a can of sweetened condensed milk in its list of ingredients. I haven’t actually purchased this milk in years once I found out how easy it is to make myself. I pulled out the few basic ingredients the sweetened condensed milk recipe calls for: powdered milk – sugar – butter – vanilla – boiling water. Since I had to drain a can of pineapple for my dessert recipe I used that juice in place of the water to add a little flavor punch but plain ole boiling water works just fine. Since I’m only making a can’s worth of milk I’m using the smaller Ninja blender and I pour in the hot juice. 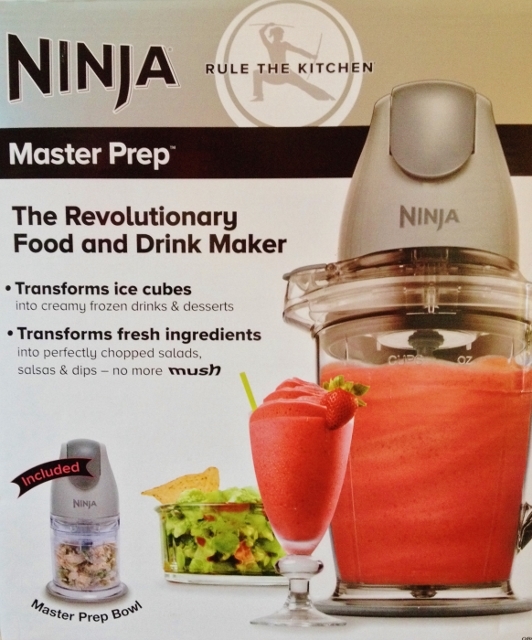 Then I follow with powdered milk, sugar and vanilla and pulse the Ninja for about 20 seconds. DONE! Can you even believe how quick that went?? I know I can’t. I mean I’m not lazy in the kitchen but.. OK yes let’s be honest, I’m very lazy in the kitchen and any quick easy and inexpensive shortcut I can come across is a winner in my book! 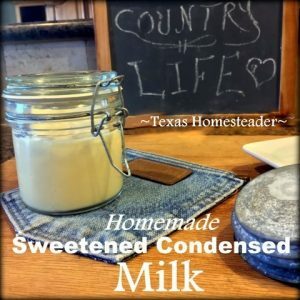 To me it’s shocking how easy it is to make this sweetened condensed milk and yet in our area a single can of the name-brand stuff sells for about $3.49. CRAZY! Now I’ve only used this milk recipe in my Cherry Shtuff no-bake dessert over the years but it’s worked beautifully for me Every. Single. Time. So I have no doubt it’ll work fantabulously in your recipe too. What? Will I share my recipe with you? Well of COURSE I will! Heat 1/2 cup water to boiling, add the butter and stir to melt. Pour into blender and add dry milk, sugar & vanilla. Cover and blend on high speed for about 20 seconds or until smooth. Use immediately, store in refrigerator in a covered container for one week or freeze for up to six months. This entry was posted in Blog Posts and tagged Cooking, Environment, Frugality, Make-It-Yourself, Recipes on December 19, 2014 by Texas Homesteader. This homemade sweetened condensed milk sounds great! I think substituting water for the pineapple juice is smart. Thanks for sharing your recipe! I have made buttermilk but not condensed milk. I through out 3 cans just this week making Thanksgiving recipes! Pinned. Thank you for sharing at #OverTheMoon. Please come back next week and share what you have been working on! I wouldn’t have thought to make my own! I can’t belive how simple it is to make. Thanks for sharing on the Waste Less Wednesday Hop! Thanks for sharing your great ideas on the Whats for Dinner link up! Amazing! I didn’t know this was possible! What a great idea to make your own! Thanks for sharing on My 2 Favorite Things on Thursday! I’m excited to start the party back up this week…hope you can come join me! Happy New Year! Pinned! Thank you. I’ll have to try this. I’ve been buying organic condensed milk but it’s not always available. I want to try this! Thanks for linking up to Simply Natural Saturdays. I had no idea it was so easy to make condensed milk. I’ll have to try this since I use a lot of condensed milk during the summer months for cold desserts. I use this so much, that I need to start doing my own. Thanks for the recipe. This is so cool. I try to only use fresh ingredients, and there are some things I did not realize I could get around. I don’t like eating things that you can’t pronounce. I am pinning this so that I have it for future reference! Thanks. I go through so much powdered milk this way. Thanks for posting. Hello from HomeAcre Hop. I can’t believe how simple this is! I’m definitely trying this! Thanks for the tutorial. What a great tip – thanks so much!! Very occaissonally I need this for a recipe and I never have it on hand. How much better (and cheaper!) to just make it – thanks so much. Pinning to save it! PS-I stopped over from This is how we roll thursday. 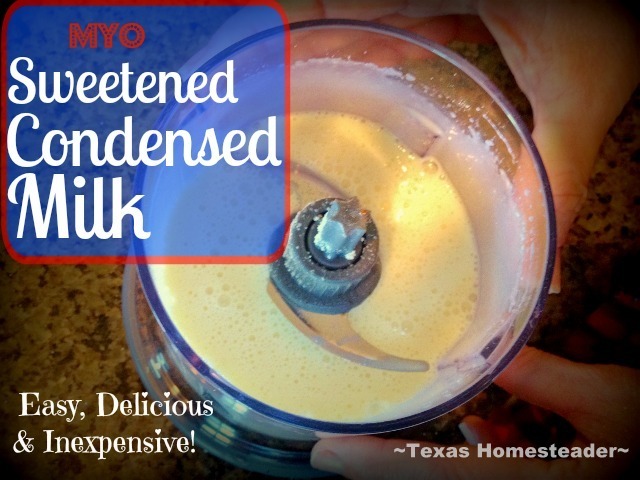 Great time saving recipe if you need some sweetened condensed milk and don’t have any around. We love making Arroz con Leche! Is there any reason that this could not be home canned? I would sure like to try that. Great post, I have had a hard time finding organic condensed milk. When I did it was expensive, it is nice to know I can make my own. Pinned, shared, followed you here from Tuesdays with a Twist. Thanks for sharing this awesome recipe! MYO anything is always better, in my opinion! I learn so many cool and empowering things from you that I would never have thought to do on my own. This is fantastic! Thanks for sharing on Merry Monday! This is great, thanks for sharing at Good Morning Mondays. How wonderful to be able to make this instead of buying it and remembering to have it in my cupboard. Blessings to you and yours. I am soooo excited to find this post. I just published a post on my blog with the recipe for my 2 ingredient fudge and of course it uses sweetened condensed milk. I love finding ways to reduce my family’s chemical exposure and this suits perfectly. I will definitely add a link to your recipe on my page! I’ve been using my homemade scm for my go to bread recipe. Works well. Merry Christmas from the other side of the county! Thanks for sharing this recipe. I am adding it to my collection. Like you, I have many reasons for wanting to do it myself, but for me, it’s mostly the satisfaction of knowing I can make my own. Merry Christmas to you and yours. Great idea! I’m going to give this one a try. About the extra pineapple juice: I use crushed pineapple in quick breads. My DH loves to drink the juice but most times I have more than he can drink. Solution: I pour the juice (pulp and all) in ice cube trays and freeze it. When frozen I remove the cubes and store them in zip-lock freezer bags in the freezer. When the hot weather hits, we add a few to a glass of water for a refreshing and cool drink. Nothing is wasted at our house, if possible. But I’m with you, I hate adding the cans to the landfills. Happy Holiday and thanks for the great recipe for the milk. Although I am still perfecting it, I make a coconut version with coconut milk & coconut extract (add towards the very end because the extract does not like heat). I use it mostly for a frozen Ambrosia recipe and DIY Mounds & Almond Joy. We never really liked coconut before this. Great idea adding the pineapple juice, I never would have thought of that! This is a very useful recipe. Thank you for sharing. Just a note that if you substitute organic coconut oil, which is solid when stored in a cool place, for the Crisco this coating becomes “heart healthy.” Thanks, again. I was referring to the Crisco in Colleen B’s recipe for Miracle Pan Release. Sorry for the confusion.